4. Plant associated fungi from trace element rich soils and their possible role in metal uptake by their host plants. 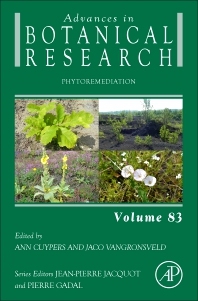 Phytoremediation, Volume 83, the latest release in the Advances in Botanical Research series, covers a variety of new topics, including Metallophytes from calamine and serpentine soils (incl. tolerance mechanisms), The (endophytic) microbiome of plants from metal contaminated environments: small organisms (inhabitants), large influence, the Potential role of plant-associated bacteria in plant metal uptake and implications in phytotechnologies, Plant associated fungi from trace element rich soils and their possible role in metal uptake by their host plants, Phytoextraction: Status and Promise, Molecular and cellular aspects of contaminant toxicity in plants, and a section on Bio- and phytoremediation of pesticide-contaminated environments: a Review. This series publishes in-depth and up-to-date reviews on a wide range of topics in the plant sciences, featuring reviews by recognized experts on all aspects of plant genetics, biochemistry, cell biology, molecular biology, physiology and ecology.